Presents case profile reports and the results of a cross-case analysis. Discusses findings in terms of implications for research, theory, and practice. This is the 141st issue in the New Directions for Evaluation series from Jossey-Bass. It is an official publication of the American Evaluation Association. J. Bradley Cousins is a professor of educational administration in the Faculty of Education, University of Ottawa, and editor-in-chief of the Canadian Journal of Program Evaluation. Isabelle Bourgeois is the editor of Organizational Capacity to Do and Use Evaluation: New Directions for Evaluation, Number 141, published by Wiley. 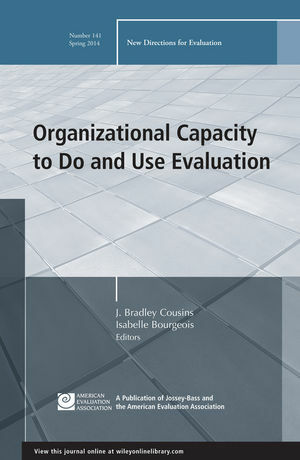 This introductory chapter focuses on evolving conceptions of evaluation capacity building through an in-depth discussion of evaluation use and organizational evaluation capacity. We present the guiding framework for our multiple case study and also identify implications for research and practice stemming from the framework. This chapter focuses on the cross-case analysis and presents the themes that have emerged from the multiple case study. More specifically, we include details on the characteristics of the organizations that took part in the study, and we then turn to a thematic analysis and discussion of key findings. In the spirit of continuing this work, we offer implications for research, theory, and practice to close the chapter. We provide some concluding reflections about the sustainability of organizational capacity for evaluation arising from informal communications with some of our case organizations.